Orlando, FL. 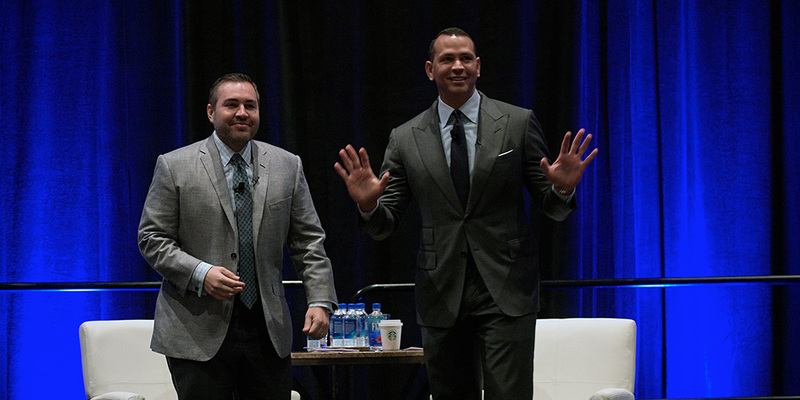 August 15, 2017 - Leading up to the Florida Realtors 101st Convention and Trade Expo, select guests and real estate professionals were fortunate to attend a pre-conference, ticketed event featuring an exclusive motivational session with a certain baseball legend. On Tuesday night, 14-time MLB All-Star Alex Rodriguez joined RP Funding CEO Robert Palmer for an evening of networking and cocktails. On a stage with two white chairs and a pitcher of water, Palmer spent an hour interviewing Rodriguez with prepared questions, occasionally offering thoughts of his own as they related to real estate. "We all can relate to the struggle of hard work," said Palmer. "Whether it's sports or real estate or my business, it's all about putting in the hours. Especially early on in your career, there are no shortcuts." For all that Rodriguez has accomplished, it's difficult to say he achieved any of it through shortcuts. Just a few short years ago, he was arguably the most maligned name in baseball. In 2014, he served a year-long suspension - the longest in baseball history. "Five out of seven nights during my suspension, I woke up crying," he said. "I'd stare up at the ceiling and ask myself, 'how did I ever get into this position?' ... Some nights I just felt like quitting, knowing I had disappointed my mother and my kids and the people that believed in me. But what I realized was, the full year was a blessing. It gave me an opportunity to turn the lens inward and really value what was going on to make these types of mistakes." This soul-searching soon led him to discover a strong desire to build for the future. "I'm a thinker," said Rodriguez. "There's not much there, but I do like to think. And I've always believed that a fool with a plan is always better than a genius without a plan." He continued, "Athletes are a little different [from real estate agents]," said Rodriguez. "Where agents can build their income until their 80, professional athletes build 90 percent of their lifetime income between the ages of 20 and 30, with an average career span of only five-and-a-half years. In addition, I saw that 70 percent of our athletes go bankrupt. The numbers don't lie. The question from there is, what happens between the ages of 30 and 50?" For A-Rod, that meant branching out into as many outlets as possible. Even today, he continues looking for new ways to implement his unique business acumen. After ending his illustrious career with the New York Yankees last year, A-Rod has already made a name for himself as a savvy real estate investor and businessman. While he's best known today as a full-time analyst on Fox Sports, he also, through his company A-Rod Corp., owns and manages over 15,000 apartment units spread across 12 states. Rodriguez also has significant stakes in the fitness industry-celebrating the grand opening of a new UFC gym located in Kendall, Florida, near where he grew up. A-Rod Corp. plans to expand this franchise to as many as 12 other South Florida locations in the near future.